« Thank You, Eli Manning, Thank You! The Chicago Cubs are apparently aggressively pursuing Brian Roberts. The Sun’s reporters give all the details here. Nick-a-What!? is reporting rumors of the Philadelphia Phillies trying to put together a package in which they would acquire both Erik Bedard and Miguel Tejada. Bedard has also been linked to several other teams, including the Mets, Dodgers, and Mariners. He is considered a “poor man’s Johan Santana,” as he would cost a team less than the Twins’ ace, but produce comparable numbers. We love Roberts here at the Nest. He is a “True” Oriole, a product of the farm system (which we don’t see here nearly often enough), and a guy who puts in his time in the community and with the fans. On the other hand, his departure would be bittersweet, as he deserves better than he has been forced to put up with here in B-More. We would love to see him back in an O’s uniform come April, but seeing him on a contending team (especially in the NL) would feel pretty good, too. 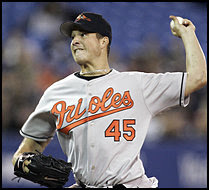 Bedard, while hardly a media favorite due to his surly disposition, nonetheless at least gives O’s fans a reason to watch every 5 days. 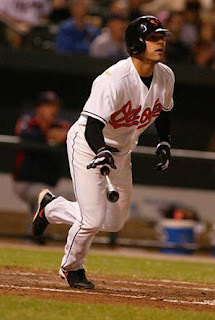 He is under Orioles’ control for the next 2 seasons, so there are pros and cons to trading him now, with his stock high. If they do pull the trigger on any deals involving Bedard, the O’s had better be sure they are getting 100 cents (or more) on the dollar. What do you think, O’s fans? This entry was posted on March 14, 2008 at 12:47 pm and is filed under News, Orioles. You can follow any responses to this entry through the RSS 2.0 feed. You can leave a response, or trackback from your own site.